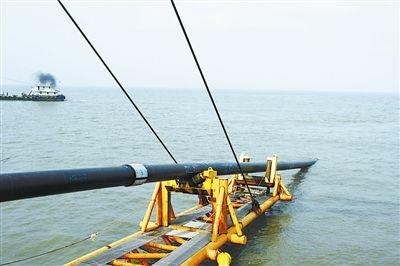 The natural gas or petroleum exploited from deep sea are usually transported by submarine pipeline. The pipe is generally carbon steel line pipe API X65 or X70. Its external surface is coated with special painting to withstand seawater corrosion. The inside of the line pipe is CRA weld overlaid by gas tungsten arc welding (GTAW) process. Generally, the clad material or corrosion-resistant alloy (CRA) selected is Inconel alloy 625. The Inconel alloy 625 clad steel pipe shall be manufactured as per API 5LD. The Inconel alloy 625, UNS N06625, is a solid solution strengthening type nickel alloy this is mainly composed of Ni-Cr-Mo-Nb elements where Mo increases the overall corrosion resistance, Cr improves the high temperature oxidation resistance, and Nb reduces intergranular corrosion by forming carbides. Since the petroleum or natural gas exploited from deep sea has many corrosive contaminants, especially H2S and CO2, common steel grade API 5L X65 or X70 can not work well. The Inconel alloy 625 has proven excellent corrosion resistance to such corrosive environment. Despite of the higher initial cost of Inconel alloy 625, its long-term steady performance under the severe corrosive conditions reduces maintenance cost dramatically. Moreover, the relatively thin Inconel 625 weld-overlay deposit provides corrosion resistance while the backing steel API 5L X65 or X70 line pipe provides sufficient mechanical strength.